Why Are Yeti Coolers So Expensive? Are They Worth It? I remember the first time I saw a Yeti Cooler in a store. I thought, that looks cool and rugged. I wonder how much it is? Wow, they want that much for a cooler? You have got to be kidding me? 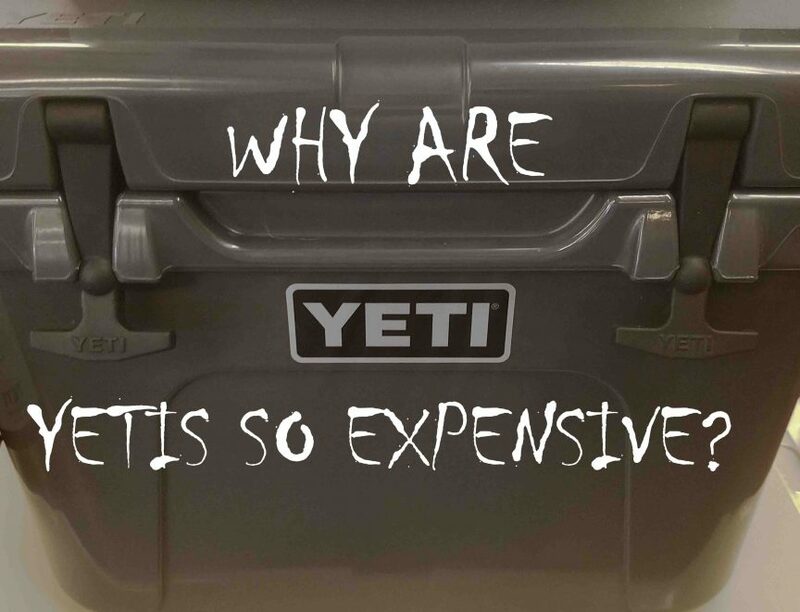 This made me think, why are Yeti Coolers so expensive and are they worth it? I was used to buying Styrofoam coolers, and ones that cost twenty dollars. I spent hours of research on the internet and I talked to outdoors equipment stores that sold them because I needed to have the answer. This article will go over in depth on why they cost so much. You may not like some of the reasons. If you are like me, stories about how brands become successful are fascinating. This is not just a history lesson, but it is important to learn about this to fully understand why the cost is what it is. The idea came from two brothers from Texas who were also fishermen. They wanted a durable cooler that they could also stand on as a fishing platform from their boat. It also had to keep ice longer than a normal cooler. One of them noticed a different style of cooler at a retail store or a trade show (I have read both.) It was heavier and more rugged than the average cooler. It was made in Thailand, and then he decided to start importing that cooler in so that he could sell it to outdoor equipment stores. The cooler was different because it was manufactured by a process called rotomolding. This produced a seamless cooler that was thicker and heavier. Not happy with the current design, they met with a manufacturing plant in the Philippines. This is the start of the Yeti Cooler and it’s high price. I think it is important to understand a little bit about the market because it has a large influence on the cost of the Yeti cooler. In 2006 Yeti was launched with a business plan to not compete with cooler giants like Igloo and Coleman. These brands dominated big box retail stores which means that small businesses that catered to fishermen, hunters, and outdoor enthusiasts could not compete. In addition, coolers are large and take up a lot of space which is not something that small retail businesses have. The icing on the cake was the small profit margin. There is just not a huge profit from selling a $25 dollar cooler. So, these smalls shops did not even think about selling coolers. Because of the biaxial rotomolding design, the coolers were very expensive to make, and initially, they needed to sell them for about $300. This high price allowed them to be sold in the small outdoors businesses. Almost everyone who goes to a fishing retail store or to a hunting store uses coolers. But, none of them carried coolers. Having something that catered to this specific market was gold, and because of the high price point, the businesses were able to get a high profit on selling them which they would not have been able to do with an Igloo. Yeti continued to work these types of businesses and trade shows, and over the years, the brand has exploded into more and more markets. To recap, the high cost of the product was actually a selling point to small businesses who could make a large profit on the cooler. Just selling a couple of them a month could get them a couple hundred dollars in profit. If you were a business, would you rather sell 2 Yeti’s or 20 regular coolers? Ok, so we have discussed the market and business plan effecting the cost to make them so expensive, now we can take a look at the actual cost to manufacture. Another reason the Yeti coolers cost so much is due to their design and manufacturing. I briefly touched on this, but they are made from rotomolded polyethelyne. This makes them very durable and virtually indestructible. It costs more to make these than it does a regular cooler. Does this design process account for the entire cost that is 10X a regular cooler? Of course not, but it does bring value, and the process is more costly. So, if they cost more to make, then they are going to be more expensive. Take a look at this video of a 500 pound man trying to break a Yeti cooler. After you watch this, you will see how well they are made. Now, you may be thinking. My cooler is never going to get body slammed by a 500 pound wrestler, and it will never be thrown off a cliff. That’s not the point. It’s the fact that these are extremely well made and very durable. You don’t have to be delicate with it. Toss it in the back of your truck. Throw it off the back of your pick up onto the ground. Toss it around in your boat and sling it on to the dock. These can take a beating. If you need something that will last a lifetime and you need a cooler that will take abuse, then get a Yeti. If you need to pack Capri Suns and PB&J’s to take the kids to the neighborhood pool, then a $30 dollar Coleman will be just fine. To recap, a rotomolded cooler costs more to make, so they are going to be more expensive. When Yeti began, it did not have an image, but it certainly developed one over time. They used brand ambassadors like saltwater fishing legend Flip Pallot to promote their products. Through their ambassadors and clever marketing, they built up an image of the die hard outdoorsmen. The cooler became a must have. In marketing terms, it is referred to as an “aspirational brand.” This means that some people will pay a premium for a brand even though they know there is a similar product on the market that costs much less. The brand definitely has cachet. In the beginning, Yeti gave away stickers and hats with every cooler purchase. Now, they charge premium prices for merchandise and apparel. When people are buying your stickers and putting them on their cars, and they don’t even own any of your products, you have built a great brand and image. Think about it this way, if you are selling coolers faster than you can make them, and if you are charging premium prices for them, would it make sense to significantly reduce the cost? Yeti has positioned itself as an outdoors brand like North Face and Patagonia, and they are not just a cooler manufacturer. To recap, Yeti coolers are the Rolls Royce of keeping things cold. They charge more because they can, and it is part of their brand. You may not like that, but it is what it is. Yeti coolers like the Tundra and the Roadie have a 5 year warranty. The good news is that the cooler is designed to have parts that are easily replaced if they do break. If you buy an expensive cooler, you don’t want it to be useless if the handle breaks on it. What does this have to do with the cost? Having a 5 year warranty costs the manufacturer money, and they have to take into account the loss in revenue from shipping brand new coolers to people for free. While they are made extremely well, they can break. To submit a claim you can visit the Yeti Warranty Information Page. The most expensive Yeti is the Tundra 350 Cooler. You can check out it’s current price on amazon here. The YETI Tundra 350 is huge with 19,000 cubic inches of capacity and it has enough space to hold around 82 gallons. It is a heavy one though at almost 90 pounds empty. The great news is that it can hold 259 cans of beer or 326 pounds of ice. This cooler is massive and is for someone who needs to hold a lot. Think of someone who has to travel long distances with meat for a bbq competition. If that is you, then you need this cooler. It will hold a lot of meat, and it will keep it cold for a long time. Yeti coolers are worth it if you need a rugged and durable cooler that can keep ice for a long time. Let me give you a personal example. I was camping with a group, and on the second night someone had to leave to go get more ice to keep things cold and frozen. They had to get in their car, drive 15 minutes away, load ten bags of ice in their car, drive 15 minutes back, and unload all the ice and refill all the coolers. All of that could have been avoided if they had a Yeti. Now, if this situation happens once every five years, probably not necessary, but this group camps about nine times per year. If you need an extremely rugged cooler, then yes. If you need to keep ice for 5-7 days, then yes. If you are in the food business, and you need to keep things frozen while mobile, then yes.